I am putting the finishing touches to sermons at the celebrations of Trinity Sunday on Sunday morning [27 May 2018] at the Parish Eucharist in both Castletown Church, Co Limerick, and – appropriately – Holy Trinity Church, Rathkeale. I have preached so often on Trinity Sunday, and I have prepared extensive preaching and liturgical resources for priests and readers in the Diocese of Limerick. But I still want to avoid saying something that is ‘reheated’ and want to say something that challenges me as well as challenging the people in these two churches on Sunday morning. As well as prayer and reading, I find it is helpful in preparing sermons to look at images that focus my attention on my sermon topic. This morning, as I pray and think, I am focused on a photograph I took last month of a fresco on the wall of the south choir aisle in Lichfield Cathedral depicting the Holy Trinity. This scene, showing the Trinity flanked by two censing angels, was probably painted in the mid-15th century, although it may even date earlier to the 14th century. Although the painting has been damaged severely in the religious strife of later centuries, it is still possible to look closely and to see how it originally depicted the Holy Trinity. As I look at it closely I can just make out the representation of God the Father sitting on a yellow or golden throne, his knees clad in a red robe. God the Father is holding his crucified Son, God the Son, Jesus Christ, before him. Originally, this mediaeval fresco would have shown a full depiction of the Crucifixion. However, all that can be seen today are the legs of Christ, with his feet nailed to the Cross. The representation of God the Holy Spirit, traditionally depicted as a white dove, is now missing from this work. But comparisons with similar paintings from this period suggest that this representation was placed in this painting in Lichfield Cathedral between the head of God the Father and the head of Jesus Christ. On either side of the Holy Trinity stands an angel, each holding and swinging a censer or incense burner, offering large amounts of incense before the throne of God. ‘Another angel with a golden censer came and stood at the altar; he was given a great quantity of incense to offer with the prayers of all the saints on the golden altar that is before the throne. And the smoke of the incense, with the prayers of the saints, rose before God from the hand of the angel’ (Revelation 8: 3-4). In Christian thinking over the centuries there has always been an element of uneasiness about representing God pictorially. Sometimes this was completely forbidden in Judaism and Islam, because of fears that the images might become objects of worship instead of God. In Christianity, a theologically unhealthy exaggeration of these reservations lead to the iconoclast heresy. 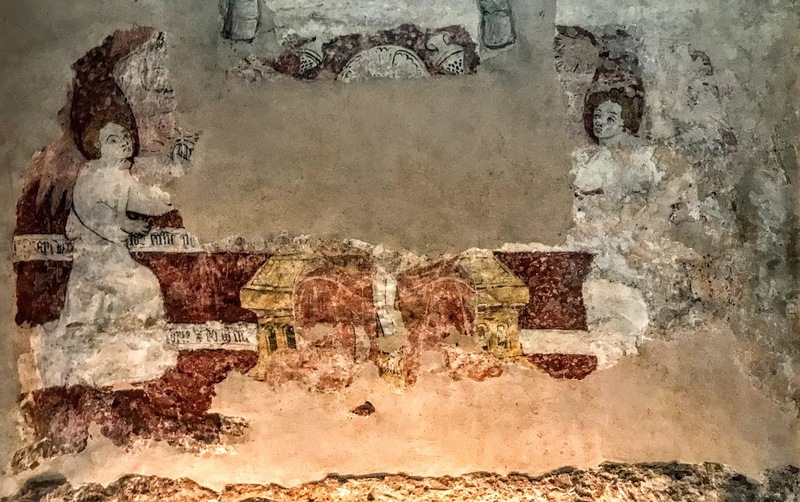 This resurfaced among the English Puritans in the 16th and 17th century, and this fresco depicting the Holy Trinity was severely damaged when it was painted over by Puritans during the English Civil War. Traces of this mediaeval wall painting were restored in 1979. Today, its condition remains a reminder not only of the cultural dangers of theological extremism and the aesthetic vandalism it encourages, but also that we can never see fully the mystical truth behind the truth of the Trinity – we cannot work it out ourselves, but we need to spend time in contemplation and prayer. ‘The grace of the Lord Jesus Christ, the love of God, and the communion of the Holy Spirit be with all of you’ (II Corinthians 13: 13).